After the two previous editions (Openness and Stories to action), it’s now time for our April edition on combining qualitative and quantitative data. While ethnography generally draws on qualitative data, it does not not mean that quantitative approaches shouldn’t be employed in the research process. Combining the two leads to a “mixed-method approach” that can take various forms: data collection and analysis can be either separated or addressed together, and each of them can be used in service of the other. Of course, this isn’t new in academic circles and corporate ethnography but there seems to be a renewed interest lately in this topic. One of the driving forces of this renewed interest is the huge amount of information produced by people, things, space and their interactions — what some have called “Big Data“. The large data sets created by people’s activity on digital devices has indeed led to a surge of “traces” from smartphone apps, computer programs and environmental sensors. Such information is currently expected to transform how we study human behavior and culture, with, as usual, utopian hopes, dystopian fears and *critical sighs* from pundits. Ethno-mining, as the name suggests, combines techniques from ethnography and data mining. Specifically, the integration of ethnographic and data mining techniques in ethno-mining includes a blending of their perspectives (on what interpretations are valid and interesting and how they should be characterized) and their processes (what selections and transformations are applied to the data to find and validate the interpretations). The Infra/Extraordinary column is devoted to zooming in on intriguing objects and practices of the 21st Century. Adopting a design-ethnography perspective, we will question informal urban bricolage, weird cameras, curious gestures and wonder about their cultural implications. , “Lausanne Pedibus” by Nicolas Nova, CC BY-NC on Flickr. Running across this “pedibus” sign on the streets of Lausanne the other day made me think about the cultural implications for such practice. 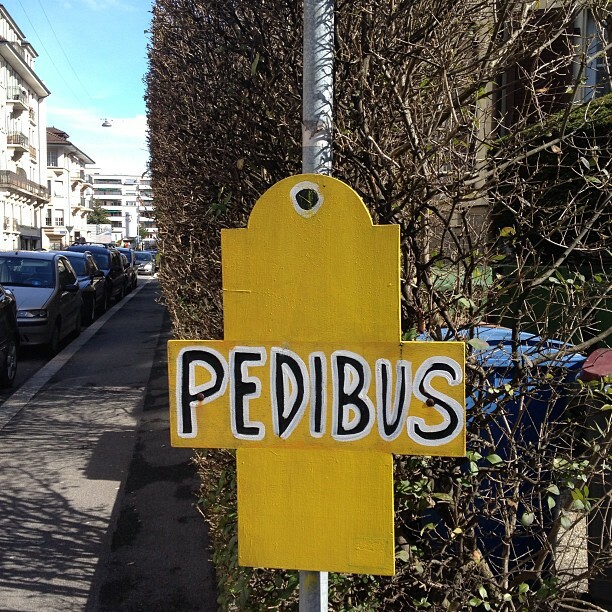 Pedibus are commonly found in European cities such as Geneva, Lausanne or Lyon and one can see them as an intriguing type of school bus line that collects students at scheduled stops located in the city, except there’s no actual “bus”. Children are “picked-up” in accordance with a predefined and fixed timetable. They are then brought to school on foot by volunteers (parents or people from the neighborhood). The name is a portmanteau word formed from the latin root “pedester” (which means “going on foot“) and “bus”. This semantic combination highlights the ambulatory character of the system, with the participants walking without any other mean of transport (that being said, I sometimes see kids on scooters when “in” the pedibus). In general, pedibus systems can be created by urban institutions, or by a group of parents who are interested in a healthy and cheap way to deal with pupils’ schedules. 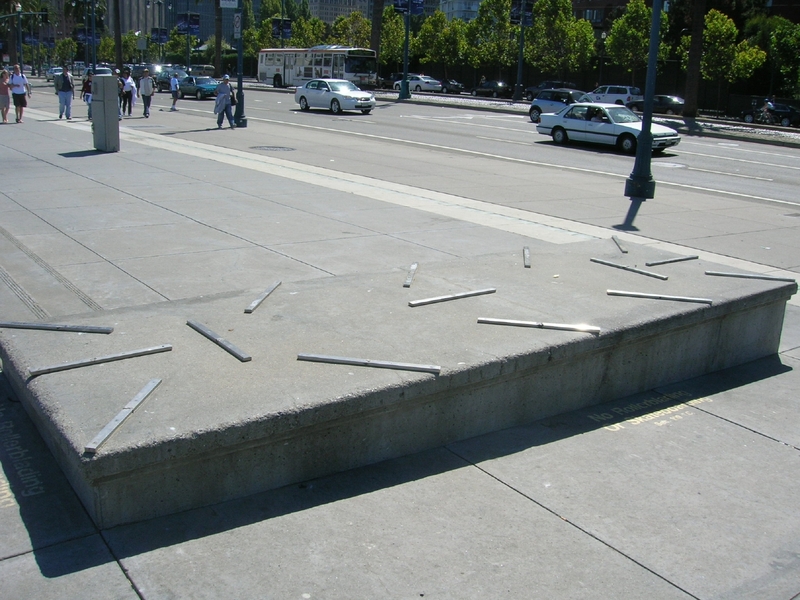 Of course, such collective services are necessarily bound to the structure of urban environment. They are indeed more likely to be found in dense (and safe) city centers than sprawl-like suburbs, but one can also run across a pedibus in the countryside in France or Switzerland. “Lausanne Pedibus” by Nicolas Nova, CC BY-NC on Flickr. The pictures above have been taken in Lausanne, a Swiss city with a population of nearly 130’000 inhabitants making it the fourth largest city of the country and 41.38 square km2 (15.98 sq mi). The website about the pedibus in this town indicates that the network is 21 km/13 miles long with 40 “lines” (approximately 575 m/0.3 mile long). A very casual form of signage: it’s made of a wooden plaque with bright colors and a hand-drawn typeface, which is a bit unusual in Switzerland with its high standard of graphic design. 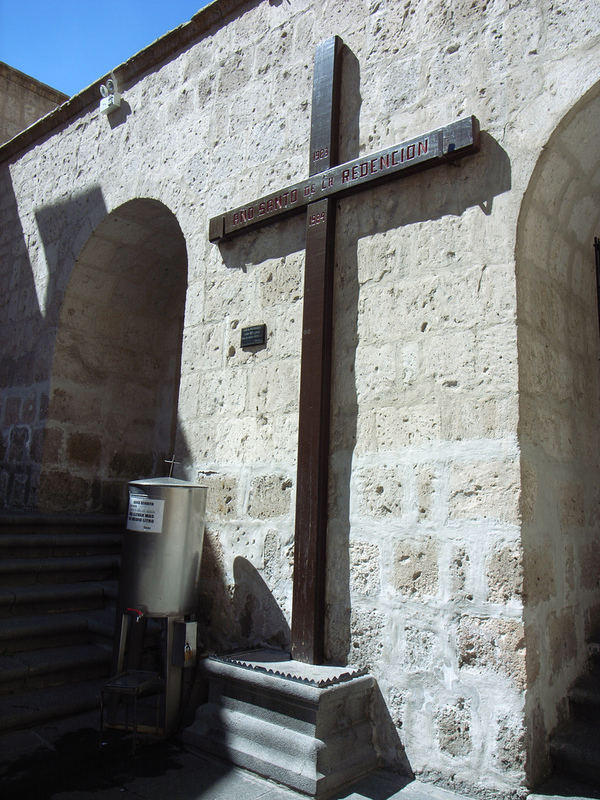 It is also attached to existing urban infrastructures (signage, wall, etc.). This highlights the informal character of this system: disconnected from the other urban signs (which have a more structured visual identity). Pedibus stops like this one are sometimes removed during summer vacations, as if to tell us the temporary existence of this means of transport (and the rythm of the “school season”). Unlike other bus stops, the timetable is pretty basic and limited to certain moments of day: morning, end of morning, beginning of the afternoon and end of afternoon (based on school schedules). 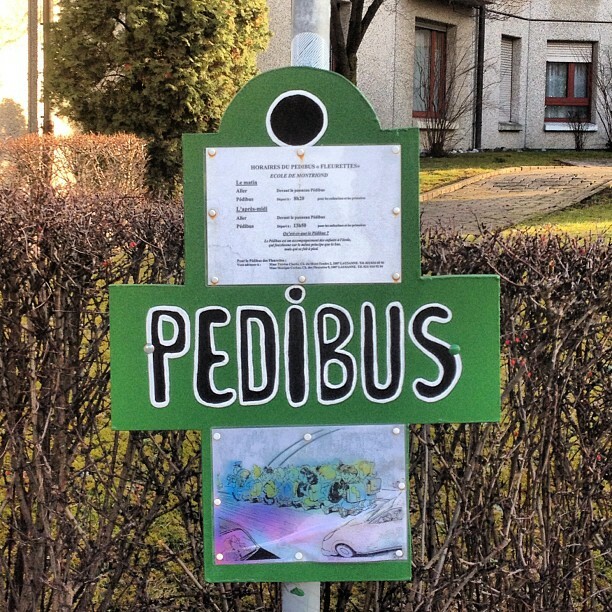 There’s a short description of what a pedibus is (with words and a drawing representing the bus): even if the system is 14 years old in Lausanne, it may tell us that it’s still important to explain what it is; probably for newcomers. Beyond my interest in alternatives means of transports, I find pedibus systems fascinating for two reasons. First and foremost, they show the importance of bottom-up innovation as well as citizen participation. That’s probably what could be called a “Smart City” from a human perspective. Second, they also reveal how innovation can be based on “removing” elements from an existing system. In this case, and because it makes sense in terms of distance, this mean of transport corresponds with the removal of the main artifact that was involved in the process: the bus. I think that this is more than the “less is more” ethos commonly found in design circles, and which strives for minimalism. To some extent, the pedibus may be another example of “innovation through subtraction“, a sociological concept that I recently encountered in this research paper: “innovation founded on reducing a practice or ceasing to use – subtracting, detaching – a given artefact.“. From a design POV, I’m fascinated by this move: you take an existing technological system (e.g. school bus), you remove the main component (i.e. the bus), and then you try to find a workaround. Do you see any other examples in your everyday life? Can you invent other examples of pedibus-like innovation with other technological artifacts/services? 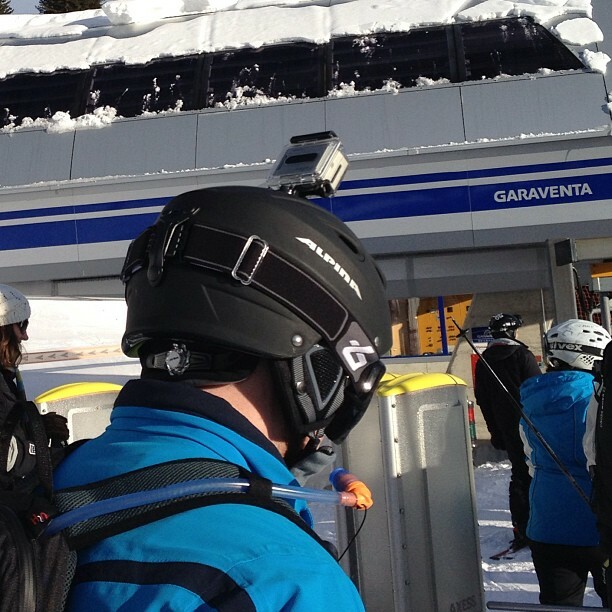 The other day in the Swiss Alps, among the crowd of heavily-protected people skiing and snowboarding, I couldn’t help noticing a peculiar type of people: the ones with a camera attached to the top of their helmets. It’s hard to miss them as this apparatus gives them extra inches as well as an odd robomechanical look. For those unaware of this intriguing outfit, this device is a “GoPro“, a camera named after the brand of “wearable” camcorders one can add on different types of gear for sport/adventure video and photography. Common usage of GoPros range from surfboarding to bungee jumping, snowboarding or just driving your car in memorable places. Contemplating such devices during my day skiing, I started noticing a certain amount of GoPro-enabled people around me each time I was in the line for a ski-lift, or at the outdoor restaurants (which left me wondering about the type of video the users might get when seated sipping their coffee). What does the recent surge in such devices indicate? What does it mean with regards to the evolution of photography? 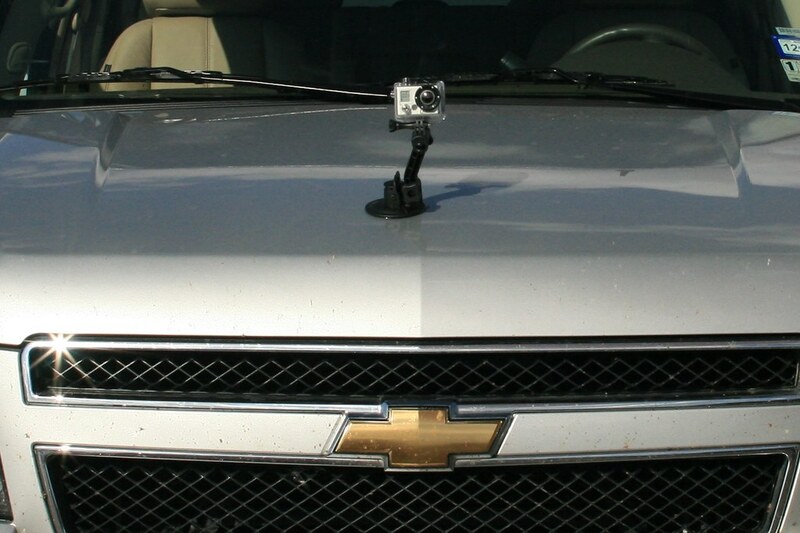 A SUV with a GoPro cam attached on it, encountered in Monument Valley, UT. In the last fifteen years, we have seen an exponential growth of digital photography. Compact cameras, SLRs and cameras available on cell phones have become ubiquitous and are used by increasing numbers of people. This situation has led to a wide range of practices, as shown by various studies in sociology or human-computer interaction. Wearable camcorders seem to be an extension of the tendency some people have to copiously document their activities on platforms such as Flickr, Instagram or social networks in general. But there’s an important difference here: the documentation is no longer discrete; it’s continuous, as long as there’s enough battery. To some extent, this documentation is delegated to a machine that is also no longer gripped by the users; it’s attached to our clothes or to specific gear such as an helmet or your skateboard. Gordon Bell, Photography by Dan Tuffs. For people interested in Human-Computer Interaction, this practice does not come out of the blue. Certain projects conducted by Microsoft in the last ten years have dealt with this already. 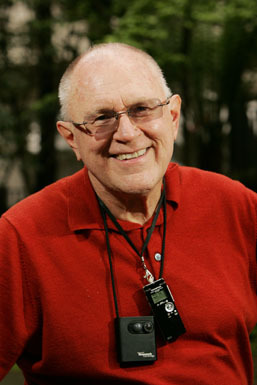 Gordon Bell, principal researcher in the Microsoft Research Silicon Valley Laboratory, is a long-time defender of what he calls “extreme lifelogging”, i.e. the exhaustive collection of data and content about one’s life in order to create a personal archive. This type of project also corresponds to existing products such as Vicon Revue or Memoto. And of course, readers of “As we may think” by Vannevar Bush in 1945 may find some similarities with the Memex project, a “device in which individuals would compress and store all of their books, records, and communications“. Of course, cameras have always been used to shoot people, but what is relevant here is to see how users can do that on their own, without the help of friends or relatives. From an Actor-Network perspective, one might say that this function has been delegated to a non-human: the camera mounted on an arm attached to something close enough to frame the user. This situation is reflected in the design of the “arm” with plenty of what they call “mounting accessories” which are aimed at different contexts. There’s a whole ecosystem of artifacts and practices to observe here! MeCam Finally, being interested in design and futures practices, I also can’t help being intrigued by the next logical move. 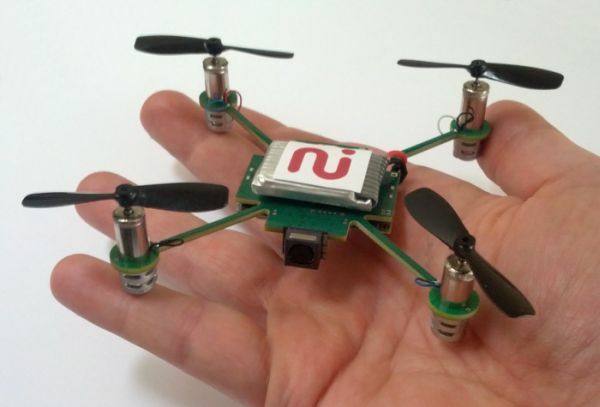 Given this practice of filming one’s self and the recent surge in personal drones, we’re only a few steps away from what I’d call “Vanity drones”, flying robots that would film users and stream the data on social networks… But, wait a minute, I just stumbled across this MeCam, a $49 camera “designed to follow you around and stream live video to your smartphone, allowing you to upload videos to YouTube, Facebook, or other sites“. Head-mounted cameras, necklace cams, vanity drones… all these artefacts highlight how digital photography evolved and how their design encapsulates assumptions about their use. One can see a trend towards the automation of data collection, which correspond to common practices on the Web and social media. 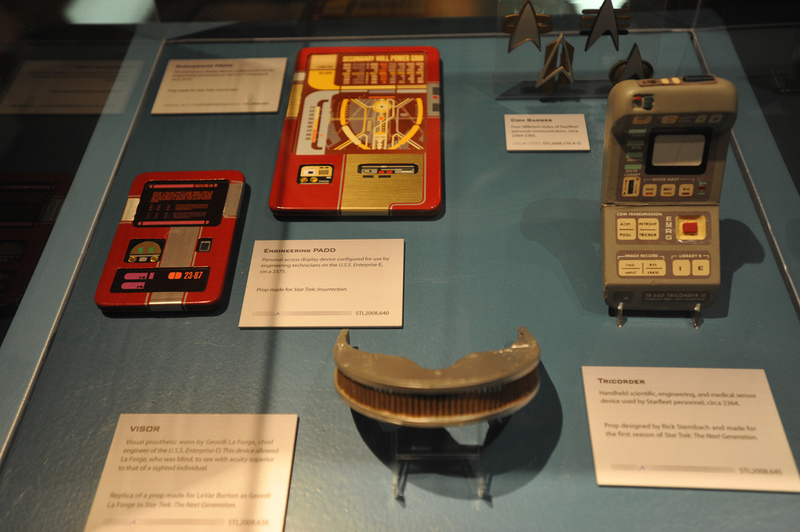 To put it differently, these devices reveal the intricate relationships between their design and our information ecosystem. Cell phone usage by a courier in Seoul, Korea. “Curious rituals” is a research project I’ve conducted last summer as a visiting researcher at the Art Center School of Design (Media Design Practice program) in Pasadena, CA. The aim was to (a) investigate the gestures and postures people do when using digital devices, and (b) speculate about their near future. The project book can be found for free as a PDF and printed as a book on Lulu. There’s a quote by Science-Fiction author William Gibson that I like a lot; it reflects what I am interested in. “I’m trying to make the moment accessible. I’m not even trying to explain the moment, I’m just trying to make the moment accessible.” (from a documentary film called No Maps for These Territories“). The reason I find it fascinating is simply that there’s a great value in producing description and making social situations and people’s behavior intelligible. Although the field studies conducted in ethnographic research can (and do) help craft theoretical constructs or models, the accurate and detailed description of what happens before our eyes is also important. This descriptive dimension is probably of interest to me because I work in the design department of an art school. A descriptive understanding of reality may be sufficient enough to inspire or frame the work of practitioners (while theories may be a bit more difficult to be digested). This is a general starting point in my work, which does not necessarily means that it’s a-theoretical (this choice itself emerges out of my interest in Grounded Theory anyways). Over the last five years, I’ve worked on different projects related to digital technologies: gesture-based interface in video-games, remote-control as gaming devices, touch interfaces, the user experience of virtual reality goggles, etc. The investigation addressed various angles but I noticed a common thread in the results: the body language people develop when using digital devices such as cell phones, laptops, robots, game controllers, sensors or any interface that involved ICTs. I started compiling examples, mostly via pictures one can find in my Flickr stream. The intuition was that it would be intriguing to explore that domain, and understand the underlying issues related to such habits. The opportunity to spend two months at the Media Design Practice department at Art Center College of Design in California then came as relevant context to investigate this topic more thoroughly. Nicolas Nova is a consultant and researcher at the Near Future Laboratory. He undertakes field studies to inform and evaluate the creation of innovative products and services. His work is about exploring and understanding people’s needs, motivations and contexts to map new design opportunities and help designers and engineers. Nicolas applies this in the domains of video games, mobile and location-based media as well as networked objects/robots. 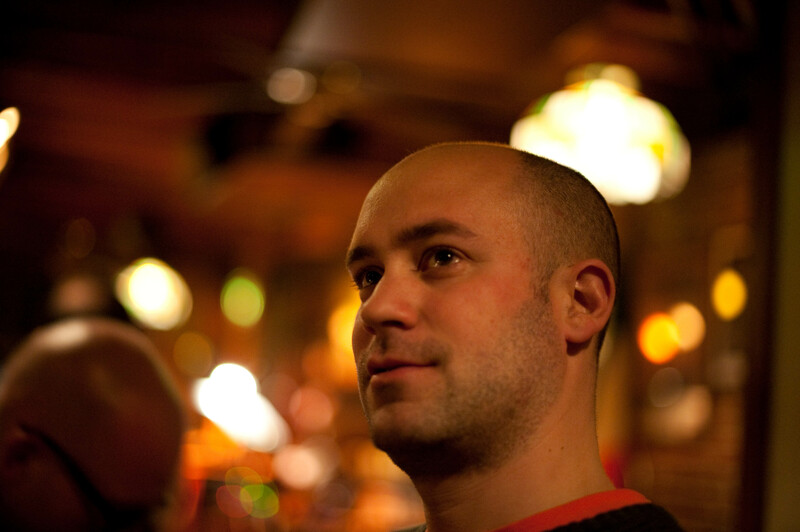 He also teaches user research in interaction design at HEAD-Geneva and ENSCI-Les Ateliers in Paris. He holds a PhD in Human-Computer Interaction from the Swiss Institute of Technology (EPFL, Switzerland). He is also editorial consultant for the Lift Conference. In his free time, he collects video game controllers and peculiar interfaces dug up in flea markets here and there. 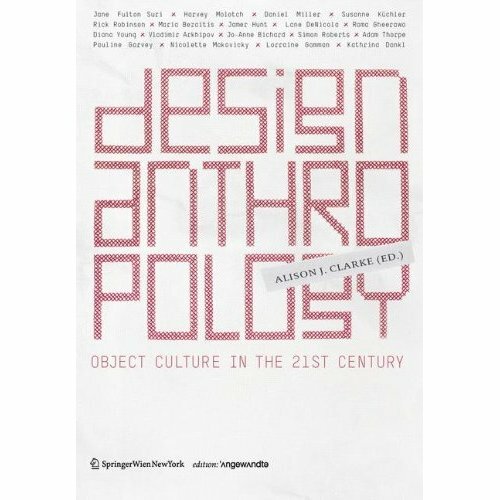 An interesting anthology describing various case studies about how different designers benefit from observing people when making new things. What caught my attention here is the wide breadth of examples presented and the description of what happens beyond data collection. As a matter of fact, several books (and presentations) I’ve read recently address the data part but are less verbose about how to turn this into “something”. And I have to admit that I’m interested in that “something”, be it a commercial product, a design fiction or a good discussion with friends. Some essays are of course more relevant to me than others but it was overall a good compilation that also covers examples beyond commercial products sold next year.